Cloud is embraced by business enterprises and governments to benefit from scalability, flexibility, mobility, responsiveness and cost efficiencies that cloud computing offers. 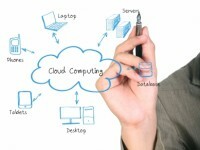 Cloud is seen as a tool for strategic partnership between customer, business and technology. Expansion of mobility and social networking created new norm for business to customer interaction. To leverage this new experience and business potential, the cost effective, easy to deploy, software as a service nature of cloud computing fits perfectly. SAP cloud solutions help organizations to grow and expand their business with scalable and tailored cloud solutions. The transformation to a cloud environment is a significant undertaking and has tremendous impact on how the business operates and delivers information. GloWiz helps organizations to develop a road map and strategy of SAP cloud solutions. We help to obtain, develop, deploy, back up, upgrade, and maintain cloud solutions. Organizations can leverage the cloud from mobility to collaboration and from in-memory databases to next generation applications.